With the ever-increasing demand for more computing power and data center servers, data center manager have the responsibility to chart a data center capacity plan and determine what strategy will accommodate business needs best. Of course, they could just expand to large facilities (upgrading to the advanced switch and fiber enclosures). However, not all IT budgets are increasing, and many users just cannot afford the extra money. Therefore, people are turning to high-density and cost-effective infrastructures. To support these applications, this article will introduce a broad selection of high-density connectivity and high capacity cable management devices. High-Density (HD) fiber patch panel solution is the most convenient approach for solving the problem of limited capacity in a data center environment. And it provides a flexible way to connect devices of different generations of equipment quickly and easily. 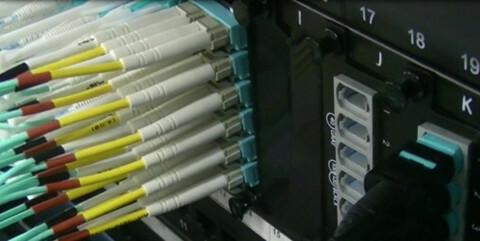 HD patch panels consist of a panel enclosure and modular HD cassettes, which can connect a fiber network feed (via multi-strand or MTP cable) and segment it into standard LC connections in order to interface with 10Gbps devices. 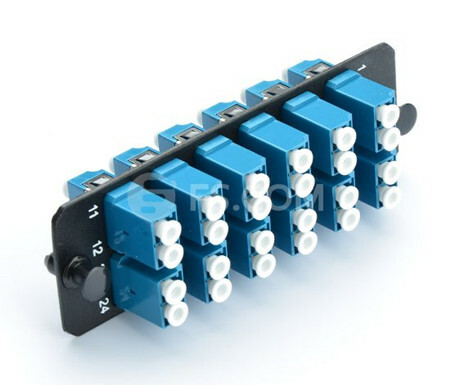 The following image shows a fiber adapter panel with 12 LC duplex single-mode adapters. Flexibility: They can connect different generations of equipment such as 10Gb, 40Gb, 100Gb in a simple panel-cassette system with different connector types. Ease of Installation: No tools are required to install the cassette in the panel enclosure. Each cassette features factory terminated connectors that reduce the time and labor required of field connector terminations. Cost-Effectiveness: High-density and ease of installation provide a low initial investment cost. Flexibility, adjustability and reliability provide a high ROI. What’s more, network reconfiguration is highly adjustable due to the modular cassette system. As cabling density increases along with the deployment of higher network speeds, HD patch cords deliver a robust design to withstand the rigorous of daily use. Cables that can offer a smaller overall diameter improve cable management by installing in dense patch cord trays that take up less space. They also provide better airflow to maintain consistent operating temperatures, reducing the likelihood of failure or downtime. Finger access to each patch cable, furthermore hinder the cable management and makes the cable installation become more difficult. To ensure easy access, high-density patch cords are easy to remove through the use of a flexible pull-tab fiber optic cable just as seen in the above picture. This cable type has the same component and internal structure as the traditional patch cords (e.g.SC FC patch cord), except the a tab attached to the connector, which makes it easy for cable management. These tabs can help increase cabling density and maintain reliability, preventing you from accidentally loosening surrounding connectors as you access the patch cord you need. MPO/MTP trunk cable is the another example of the HD patch cords. These cables are the foundation of easier, faster and better pre-terminated fiber connectivity solutions, as it allows tighter trunk cable bends for slack storage and routing. With the high-density trunks in your data center solution, less space is consumed and installation is easier. Fiber enclosure makes full used of the spaces in data center by combining most of the fiber optic connections in strong standards modules, providing solid protection of data center links and increasing cabling density. Therefore, data center managers can get easy access to fiber connections and easy cable management. Accordingly, the cost for data center installation and maintenance can be effectively reduced. Fiber enclosures are usually available in 1U, 2U, 3U, 4U. 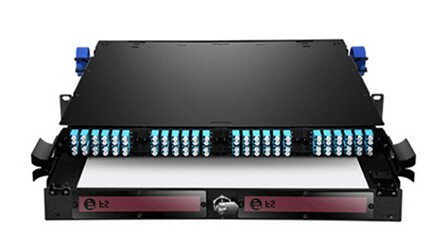 The 1U rack mount fiber enclosure is the most commonly used one on the market. Now 4U or larger rack mount fiber enclosures are also becoming popular driven by the increasing of fiber counts in data center. Except standards rack mount fiber enclosures, a lot of data centers or server rooms use customized fiber enclosures for their special requirements. FS.COM FHD Series rack mount fiber enclosures are available in 1RU, 2RU and 4RU rack unit options. With optional FHD cassette modules or adapter panels in single-mode, multimode, or 10G multimode versions, users can install, maintain, and upgrade their cabling systems in a more flexible and cost-effective way. In addition to rack mount solution, our FHD series products also support wall mount type which can meet the cabling demands on fiber industrial environments. High-density optic solutions enable data center operators to maximize the amount of active equipment and cables in a data center by minimizing the foot print of the networking infrastructure. Besides the above HD optical products, there are also a range of HD products including the high speed interconnect optics, cable assemblies, cable management hardware. If you want to know more about the HD products from FS.COM, please have a look at our website.